vSphere Power CLI User’s Guide 5.0, Chapter 3 “Installing vSphere PowerCLI”, page 15.
vSphere Power CLI User’s Guide 5.0, Chapter 2 “vSphere PowerCLI System Requirements” presents an overview of the supported Operating Systems, required software and supported VMware environments. Most VMware environments are supported. Installation is straightforward. If the PowerShell Execution Policy on your machine is set incorrectly, a warning message appears before finalizing the vSphere PowerCLI installation. Ignore it and continue with the installation. For security reasons, Windows PowerShell supports an execution policy feature. It determines whether scripts are allowed to run and whether they must be digitally signed. By default, the execution policy is set to Restricted, which is the most secure policy. If you want to run scripts or load configuration files, you can change the execution policy by using the Set-ExecutionPolicy cmdlet. vSphere Security Guide, Chapter 3 “Securing the Management Interface”, page 37. An ESXi host has a group of preconfigured services, which can be found via: Configuration, Software, Security Profile, Services Section. Behaviour can be changed by selecting a service and choosing “Options”. Services can be stopped or (re)started and the “Startup Policy” can be adjusted. 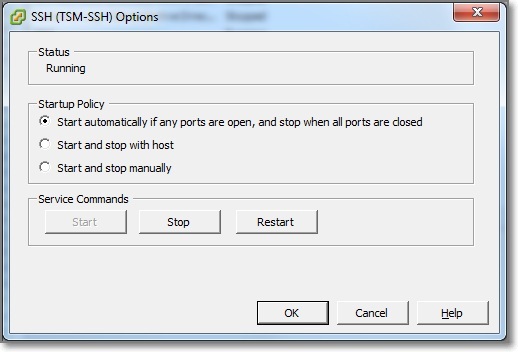 The default and recommended Startup Policy is “Start automatically if any ports are open, and stop when all ports are closed”. 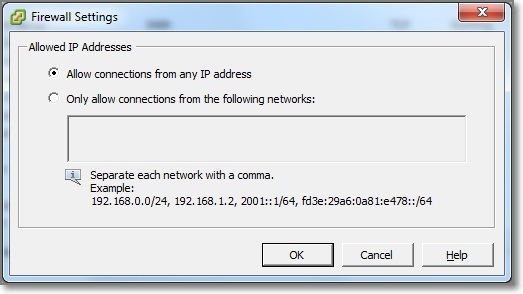 If any port is open, the client attempts to contact the network resources pertinent to the service in question. If some ports are open, but the port for a particular service is closed, the attempt fails, but there is little drawback to such a case. If and when the applicable outgoing port is opened, the service begins completing its tasks. In other words, service behaviour depends on the firewall settings. Policy “Start and stop with host” means: The service starts shortly after the host starts and closes shortly before the host shuts down. Policy “Start and stop manually”: The host preserves the user-determined service settings, regardless of whether ports are open or not. This setting is preserved after rebooting a host. 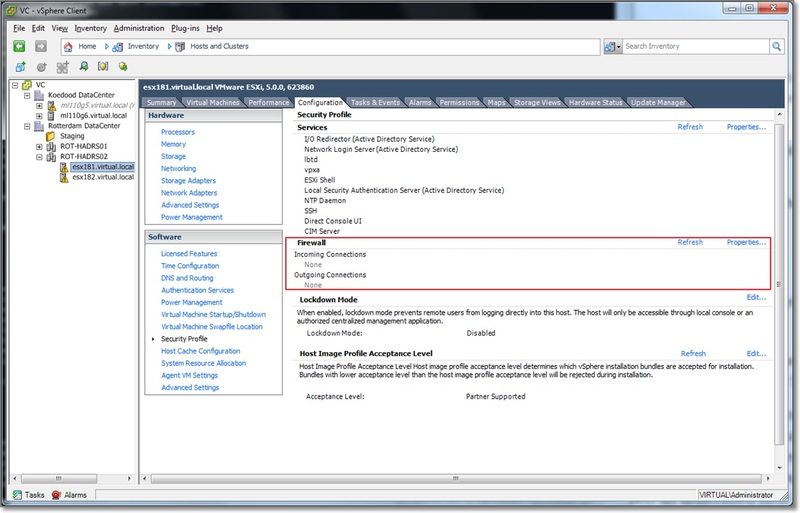 Important NOTE: ESXi firewall automates when rule sets are enabled or disabled based on the service Startup policy. When a service starts, its corresponding rule set is enabled. When a service stops, the rule set is disabled. vSphere Security Guide, Chapter 3 “Securing the Management Interface”, page 38.
vSphere Security Guide, Chapter 3 “Securing the Management Interface”, page 34. An overview of the ESXI firewall configuration can be found via: Configuration, Software, Security Profile, Firewall Section. After selecting a Service or Client, you can adjust the Firewall settings and depending on the Service, the Service Options become available (see previous section). 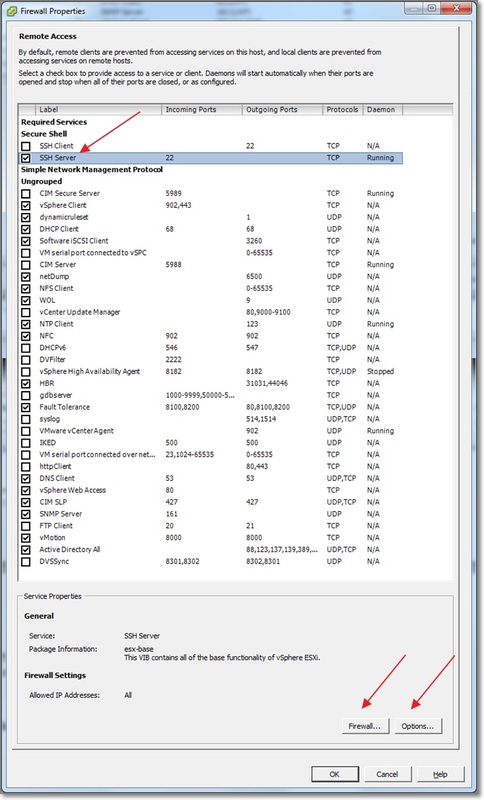 You can specify which networks are allowed to connect to each service that is running on the host. You can use the vSphere Client or the command line to update the Allowed IP list for a service. By default, all IP addresses are allowed. vSphere Security Guide, Chapter 3 “Securing the Management Interface”, section “Rule Set Configuration Files”, page 34. The firewall rule set definitions are stored on the ESXi host in the folder: /etc/vmware/firewall. The default file is service.xml. Depending on your configuration, additional rule sets can be found. E.g. : Adding an ESXi host to an HA enabled Cluster adds the fdm.xml rule set. The vSphere Security Guide contains detailed information how to create a new configuration file. Tip: you can create a new ruleset by copying an existing rule set and start editing. If you are familiar with the vi editor, stay on the ESXI host, otherwise use WinSCP to copy back-and-forth to your favourite Management station. vSphere 5.0 Evaluation Guide Volume 1, section on Image Builder, page 91. Good reading on Auto Deploy Rules and Rule Sets by Joe Keegan (thanks Joe!). 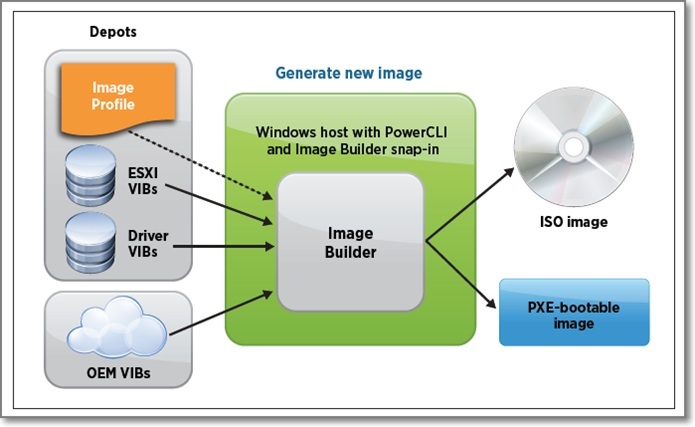 VMware Blogs Using the vSphere ESXi image Builder CLI by Kyle Gleed. I have Prepared my home lab for Auto Deploy. I have watched Trainsignal vSphere 5 Training, lesson 28 on this subject. Also this post “Using vSphere 5 Auto Deploy in your home lab” by Duncan Epping was very useful. In a small home lab you will practice by using nested ESXi servers, read this post by Eric Gray, or this post by Vladan Seget. The vSphere 5.0 Evaluation Guide Volume 4 – Auto Deploy was also very useful for a good understanding on how to set up Deploy Rules. 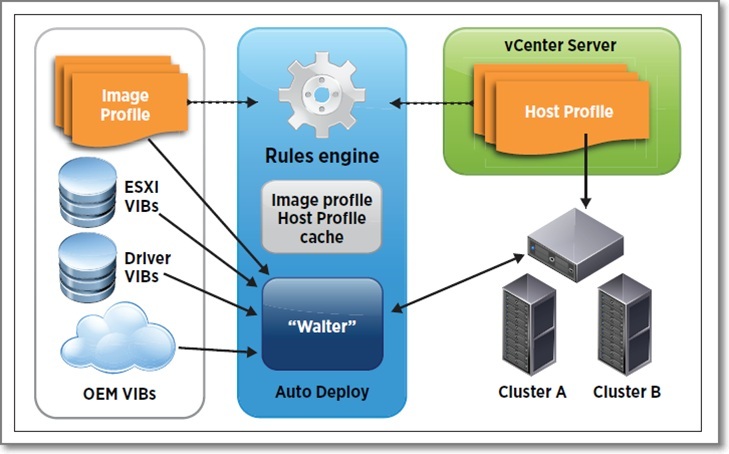 In this guide the three Deploy Rules (Image Profile Rule, vCenter Folder/Cluster Rule and Host Profile Rule) are being used. The last step so far is reading Chapter 5 in the vSphere Installation and Setup Guide to glue everything together. vSphere Installation and Setup Guide, Chapter 6 “Using vSphere ESXi Image Builder CLI”, page 123. The Image Builder CLI, is a set of PowerCLI Cmdlets that allows you to create and maintain custom ESXi images used to deploy hosts in your vSphere 5.0 environments. Offline depot (ZIP file), to be used by vSphere Update Manager or by the esxcli software vib command. The Concepts of Image Builder are explained in vSphere Installation and Setup Guide , Chapter 6, “Using vSphere ESXI Image Builder CLI”, page 123.
vSphere Virtual Machine Administration, Chapter 4 “Authentication and User Management”, Section “Managing vSphere Users / Groups”, page 42. 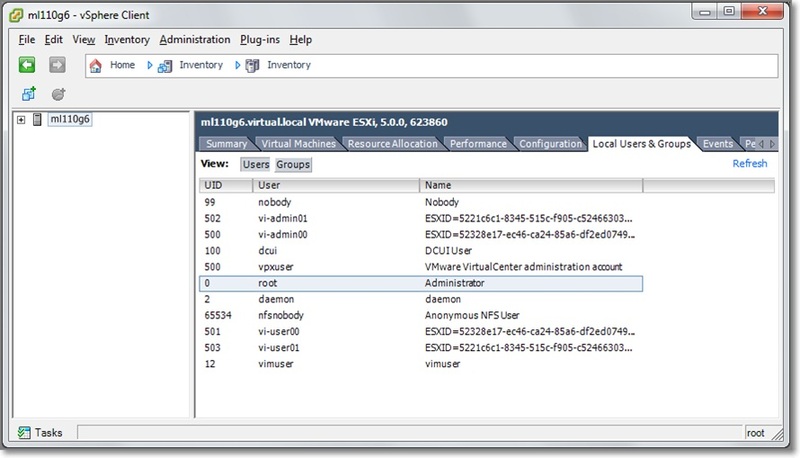 When a vSphere Client or vCenter Server user connects to ESXi, a connection is established with the VMware Host Agent process. The process uses the user names and passwords for authentication. 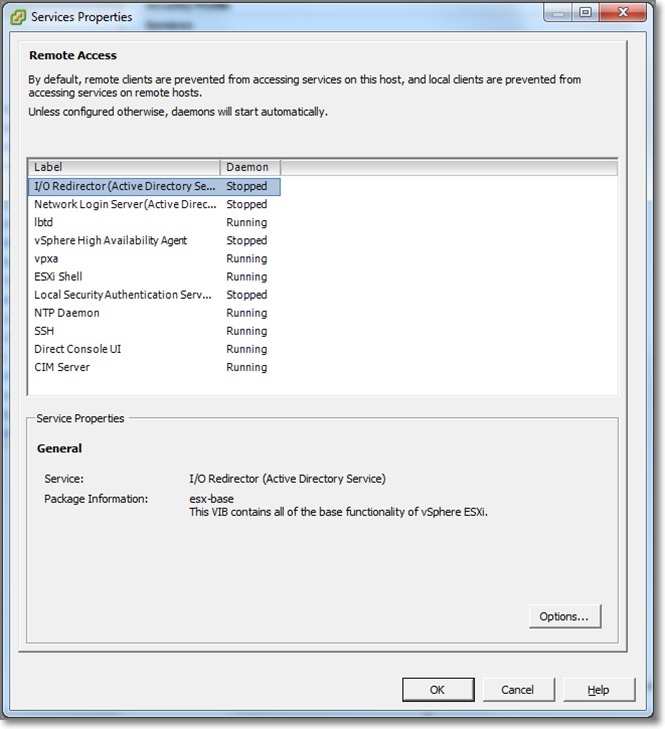 ESXi authenticates users accessing hosts using the vSphere Client or SDK. The default installation of ESXi uses a local password database for authentication. ESXi uses the Pluggable Authentication Modules (PAM) structure for authentication when users access the ESXi host using the vSphere Client. The PAM configuration for VMware services is located in /etc/pam.d/system-auth-generic, which stores paths to authentication modules. Changes to this configuration affect all host services. Do not create a user named ALL. Privileges associated with the name ALL might not be available to all users in some situations. Use a directory service or vCenter Server to centralize access control, rather than defining users on individual hosts. Choose a local Windows user or group to have the Administrator role in vCenter Server. Because of the confusion that duplicate naming can cause, check the vCenter Server user list before you create ESXi host users to avoid duplicating names. To check for vCenter Server users, review the Windows domain list. Important Note: By default, some versions of the Windows operating system include the NT AUTHORITY\INTERACTIVE user in the Administrators group. When the NT AUTHORITY\INTERACTIVE user is in the Administrators group, all users you create on the vCenter Server system have the Administrator privilege. To avoid this, remove the NT AUTHORITY\INTERACTIVE user from the Administrators group on the Windows system where you run vCenter Server. You are currently browsing the Adventures in a Virtual World blog archives for October, 2012.